There are many reasons to use cloth nappies, both personal and environmental. In fact there are as many reasons as there are cloth nappy systems! We went cloth and have never looked back. But rather than tell you why you should, here are some pro’s and cons for your consideration, as well as some handy tips if you decide to give it a go. By not filling landfill with plastic you are making a great environmental choice. Cloth nappies can also be used for multiple children and eventually as rags. Cloth diapers are gentle on the baby’s skin. Cotton diapers allow air to circulate to baby’s skin. They are naturally absorbent and put less friction on the baby’s skin thereby reducing the chances of a diaper rash and baby has less contact with chemicals and plastics. There are many different cloth nappy systems, some very stylish and some very simple. There are a few studies that have shown that if a baby feels wet (in cloth nappies, as modern disposables whip away the moisture so fast that baby never feels they have wet themselves) then they will potty train earlier and with more success. If baby spends the first few years of their life learning its okay and comfy to wee anywhere, its harder to break the habit. Disposable diapers, according to some researchers, use chemicals that can cause Toxic Shock Syndrome, which harms the immune system and impairs the hormonal system, causes liver disease, asthma, and UTI in baby girls. You do have to launder almost every day at the beginning and then every second day or so. Getting the nappies dry is the hardest thing if the weather is bad you have to tumble dry. This depends on what you are comparing it too. We use cloth and they do get a bit smelly compared to a biodegradable natural disposable nappy we use when out or on holiday. However, we once used a normal disposable brand for a few days as the biodegradable ones were sold out and they smelt more than the cloth. Either way, you just have to keep soiled nappies in a sealed container (we bought a foot pedal bin with a removable insert). Wash or rinse daily – in the morning I rinse the nights nappies on a quick rinse and spin cycle and then wash with fully soiled ones later. You can always use disposable nappies when you are out and the cloth are just as easy to use at home. There are also a few tips if you want to use cloth nappies. 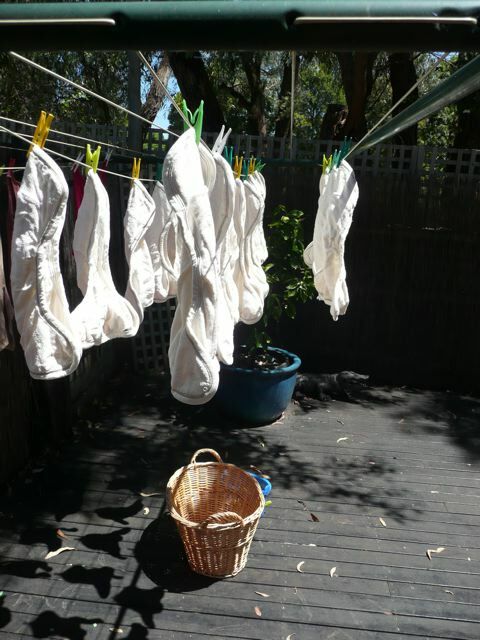 Hang to dry in the shade for softer nappies. At the least hang so the outside faces the sun and the inside dries slower and doesn’t ‘crisp up’ in our lovely Aussie sun. Use nappy liners, not so essential when newborn or when on bub is fed on breast milk, but definitely save from as much staining and scraping as bub gets older and starts eating solids. Find a natural or oxygen based powdered bleach that is milder on babies bum and the environment. Tags: Cloth nappy, disposable nappy, nappies. Bookmark the permalink. I am also a fan of cloth nappies. I agree that it made toilet training a little easier, but is also was more comfortable for my children and reduced the risk of them getting nappy rash or other skin irritations. They are definitely cheaper in the long run compared to disposable nappies.